A very good friend of mine told me many years ago that my nickname should be “Suzy Carefree” because he perceived me as a person who takes life’s challenges rather lightly. Somehow he was right because I try to look at the bright side of things, and I definitely don’t worry before I go to bed. I think this is a total waste of energy. Having said this, as a regular reader you may already know that I have been through my own share of “stuff”. There were times when I was far away from being “Suzy Carefree”, and I literally cried my head off, thinking I will never get any business. I was diving into a mental state of hopelessness and helplessness. It was pretty bad and there were times when my friend and business associate Heidi Garcia was definitely concerned about me and my emotional state. I enjoyed having my pity parties but I never stayed down for too long. After about 2 hours of crying I started to feel better (this was my emotional cleanse), and then I wrote my next newsletter. Heidi is probably reading this right now, so “thank you” Heidi for putting up with me over all these years. Thankfully we have never felt down at the same time. Over the past 11 years I have learned to manage the mud (difficulties presented by the outside world) pretty well. I am now fully aware what I give my attention to. What about you? 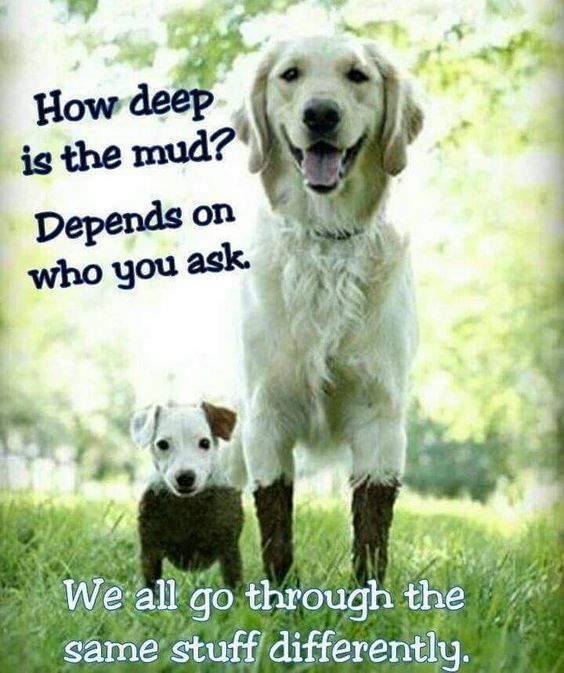 How deep is your mud? There is always someone who has it worse than you do. You’re not rejected, you are only redirected. Stinking thinking won’t serve you – change your thoughts, change your life. You can’t be everyone’s cup of tea, otherwise you would be a mug. Life is too short to wake up with regrets in the morning. If you feel stuck, it helps to remember that you are in control of your life if you choose to be. Trust in yourself and your abilities, and don’t live in fear!